Rarely will you find so many different recipes for what purports to be the same dish. Some books specify waxy potatoes; some say floury ones are essential. Some say soaking the potatoes first is crucial; others say it's anathema. Some insist you boil the potatoes and cream before baking. Some use lots of garlic; others only a suggestion. Some add onions, cheese or mushrooms; this horrifies purists. What follows is the method I've always used. 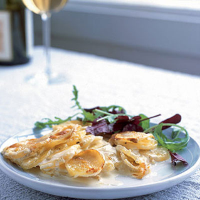 It owes most to Nigel Slater's dauphinois: a very simple version with minimal preparation. Preheat the oven to 190°C, gas mark 5. Butter a gratin dish, about 30cm x 20cm, with a 2-litre capacity. It must be broad and shallow or the potatoes will take ages to cook. The broad top allows maximum 'gratination'. Peel the garlic, slice in half and put in a pan with the cream and milk. Heat to just below boiling and set aside to infuse. There's a lot of cream in this dish, but it is important: if you use a thinner mixture, such as milk and single cream, it's more likely to curdle in the oven, and it just doesn't taste as good. Peel the potatoes and cut into slices 3mm thick. I use waxy potatoes because they keep their shape even when soft, giving the gratin a lovely texture. Plenty of cooks prefer floury spuds, which absorb the cream more readily and even dissolve into it. You can slice the potatoes by hand, but a food processor makes it very quick. Layer the potatoes in the dish. Make the layers as flat as possible so there aren't gaps that will hold too much cream. Season every few layers with salt and pepper. For the top, overlap the potatoes neatly. Remove the garlic from the warm cream and pour over the potatoes; it must almost cover them, so add more if needed. Bake for 1-1½ hours, till the potatoes are soft throughout and have absorbed most of the cream, and the top is golden with patches of brown. Serve alongside a green salad, sausages, grills, or lentils.